I don't know about you, but my dogs have an uncanny ability to sniff out Barkboxes. We're always getting all sorts of deliveries thanks to my bf and my lack of restraint - he gets car parts, I get sub boxes and crafty stuff. 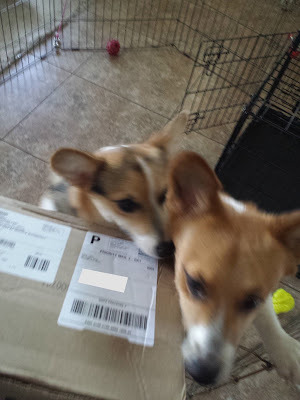 The dogs show a whole lot of indifference UNTIL A BARKBOX ARRIVES. Then they're all over it like flies on cow pies. Summer's almost over (or already over for some folks...*crycry*) so it's a great time to send summer off with a bang by having one last kickass party. I'm talking about a block party. 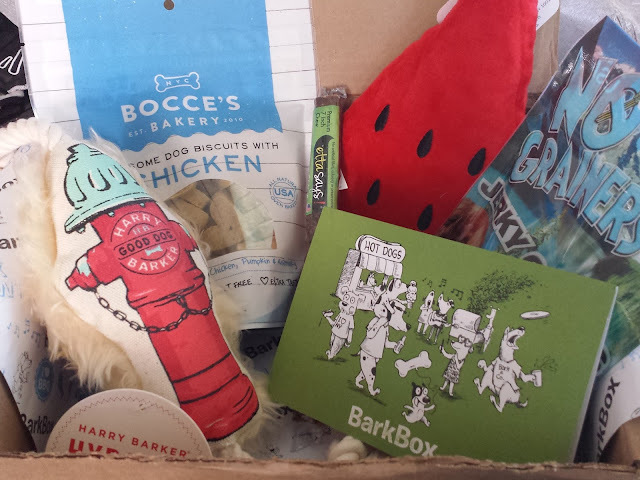 The folks over at BarkBox are totally on it and sent our pups a box chock full of goodies perfect for a (doggy) social gathering. Delca Corp Melon Collie Watermelon (Value: $11) - Every box comes with at least one toy produced exclusively for BarkBox and for some reason it's always a plushie. 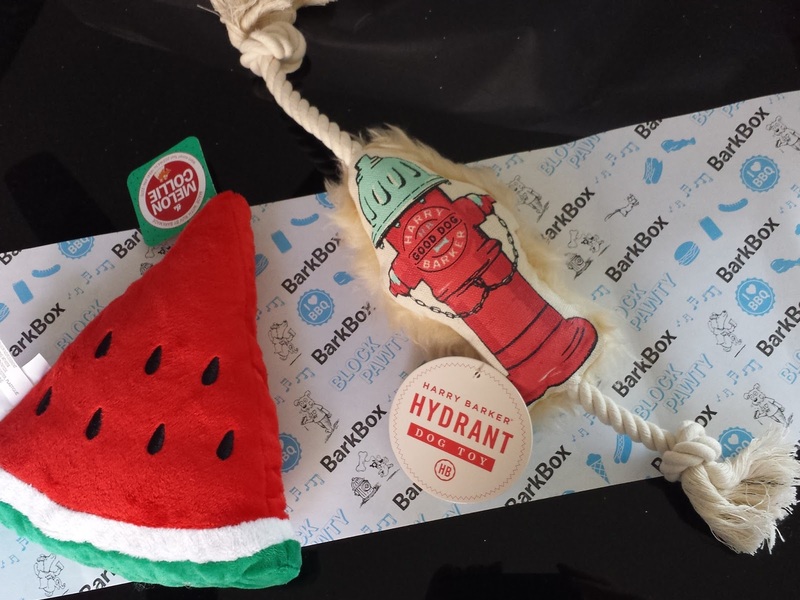 I love these BarkMade exclusives because they're so darn cute; unfortunately, my dogs also love plush toys. Like way too much. Pebbles will be sure to love every single plush toy until its insides are gloriously scattered all over the carpet. Then Macho takes over and ensures that the squeaker is successfully torn in half and proceeds to chew on the little squeaker tube and I end up chasing him around like a madwoman until I can steal it back from him to avoid having a real-life squeaky dog. It's a very chaotic scene. Another repeat is not at the top of my list of things to do this month so I must relinquish the fragile squeaky. The bigger question is: why do I have a camera at the ready? 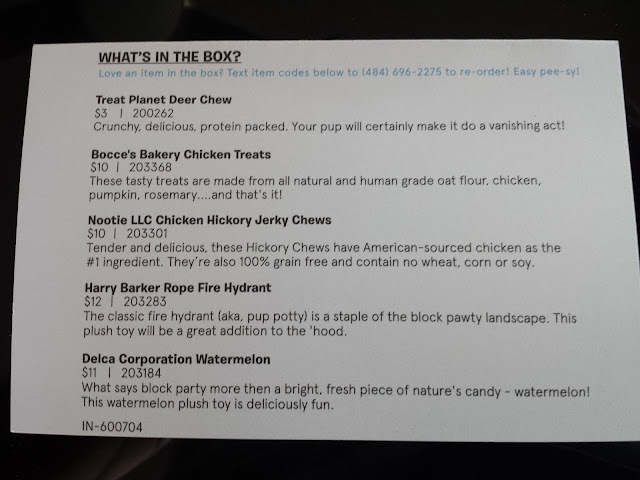 Treat Planet Crunchy Deer Chew ([Inflated] Value: $3) - Etta Says is a brand owned by Treat Planet and it's become a BarkBox staple, kind of like how Barkworthies bully sticks used to be found in every box last year. Personally I prefer the bully sticks since they last longer but my dogs love it either way. The pups have gotten to try tons of protein sources thanks to BarkBox and I'm glad to say they don't discriminate; chicken, beef, lamb, buffalo, rabbit - you name it, they'll eat it. I've even gone as far as to buy them venison dog food and they inhaled that to the last kibble. This deer chew will be loved by whoever doesn't ruin my DIY wedding decor. It's pretty crumbly but trust me, your dog will leave no mess at all after he's done with it. Bocce's Bakery Chicken Biscuits (Value: $10) - When Macho was an only pup he preferred meaty treats over biscuits. Now that he has a little sister (who actually has more alpha male qualities than he does), he takes whatever he can get because Pebbles will stop at nothing to get every. single. treat. I already know they love chicken and I know they love Bocce's Bakery. This is a guaranteed win with my fluffbutts. No Grainers Jerky Chews - Hickory Bacon Flavor (Value: $10) - Pebbles does anything for this treat. In fact, we have a bag of this exact one open at the moment. These are great because they're 2" long sticks, perfect to either break in half for a bedtime snack or to stuff inside treat bones. They smell pretty good too so I don't mind stuffing them into my pocket when we go on walks. So, I'd say this was another pretty successful month. I'm glad at least one of the toys can finally go to the dogs. I've either been hoarding them because they're too cute or putting them up for swap because they deserve to stay intact for at least a week. The treats are always a hit with the furballs so that's never an issue. 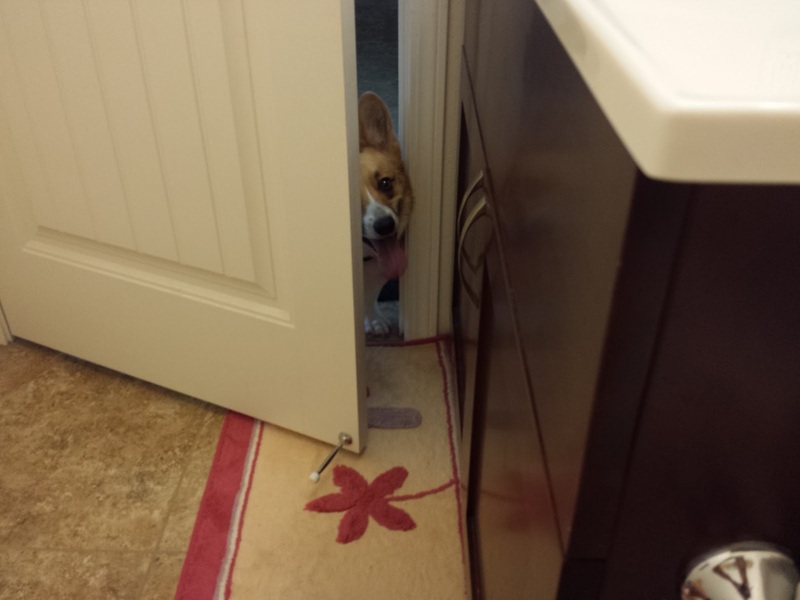 If you're not a Barkbox subscriber yet you definitely should be. It was one of the first dog sub boxes out there and is still super popular (they even have their own commercials!). 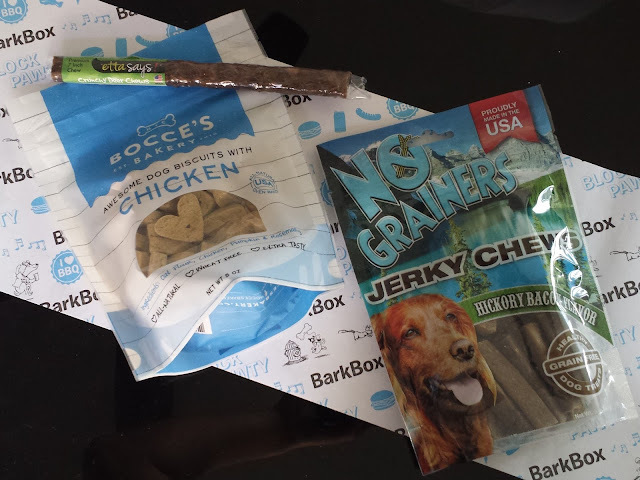 You can get a BarkBox for as low as $18/month -- plus get a free box tacked on to your subscription just for using my link! Much mahalos if you do use it!